A look at the changes in Game Update 5.2. Warning: This post contains HEAVY spoilers. You have been warned. A look at the changes in Game Update 5.1.3. A look at the changes in Game Update 5.2 PTS 7. Please note that this is not a compete list of all changes in the patch, is subject to change at any time (info is from PTS files), and is our own personal interpretation of the data. A look at the changes in Game Update 5.2 PTS 6. Please note that this is nota compete list of all changes in the patch, is subject to change at any time (info is from PTS files), and is our own personal interpretation of the data. A look at the changes in Game Update 5.1.2. A look at the changes in Game Update 5.2 PTS #5. Please note that this is not a compete list of all changes in the patch, is subject to change at any time (info is from PTS files), and is our own personal interpretation of the data. A look at the changes in Game Updates 5.2 PTS #2, #3, and #4. Please note that this is nota compete list of all changes in the patch, is subject to change at any time (info is from PTS files), and is our own personal interpretation of the data. A look at the changes in Game Update 5.1.1. A look at the changes in Game Update 5.2 PTS #1. Please note that this is nota compete list of all changes in the patch, is subject to change at any time (info is from PTS files), and is our own personal interpretation of the data. Galactic Command Gearing Changes -- We know that the changes in 5.1 are just the start. We are looking into simplifying, making faster, and making more alt friendly the gearing in GC. We are also looking into making getting through Command Ranks faster. Two returning Companions: Quinn and Elara. After completing Iokath's storyline, it opens up into a new daily area. Bioware is planning to have a PTS for 5.2 in the next few weeks. More details to follow. 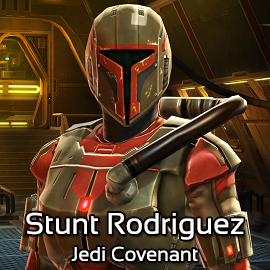 A list of the Cartel Market Sales available for January 24th, 2017.